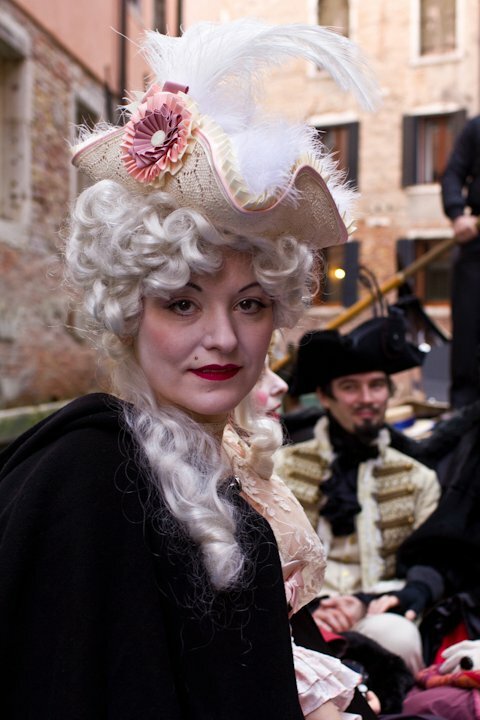 I've just returned from an amazing trip to Carnival in Venice, Italy. 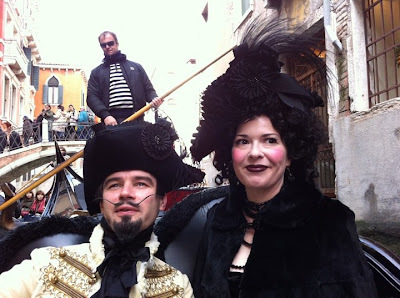 It was part adventure with good friends, part pilgrimage (Venice has been a major center of masquerade activity for close to 1,000 years, and Carnival is the mother of all costume parties), part lifelong-dream-fulfillment, and part 10-year wedding anniversary celebration for myself and my husband John. Traveling with close friends who are also costumers, designers and artists made the experience even more special. We started working on our costumes last fall, and during the last few months before our departure for Italy in late February, making outfits was pretty much ALL we did beyond the bare minimum of eating, sleeping, and work. We had a magical, amazing, fantastical time in Venice, and started planning our trip back for Carnival 2012 before we even returned to San Francisco. Venice is truly beautiful and fascinating, and we met so many amazing new friends - it was like summer camp for adult costumers. I can't wait to go back! Here are a few pictures from our trip. There were too many great shots taken to include them all (thanks to the fine photography of Daniel and Steph). 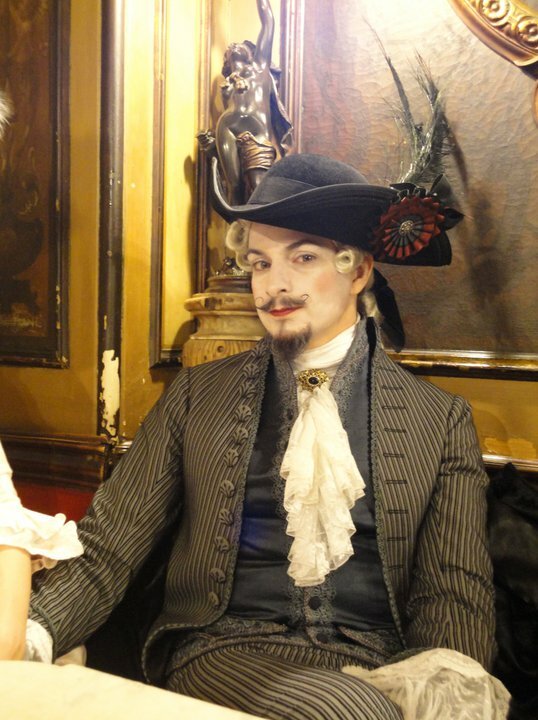 Unless otherwise noted, costume pieces were made by the person wearing them in the photo (or someone else in our group), or pulled from one of our closets (John's heavily-braided jackets were borrowed from another friend). 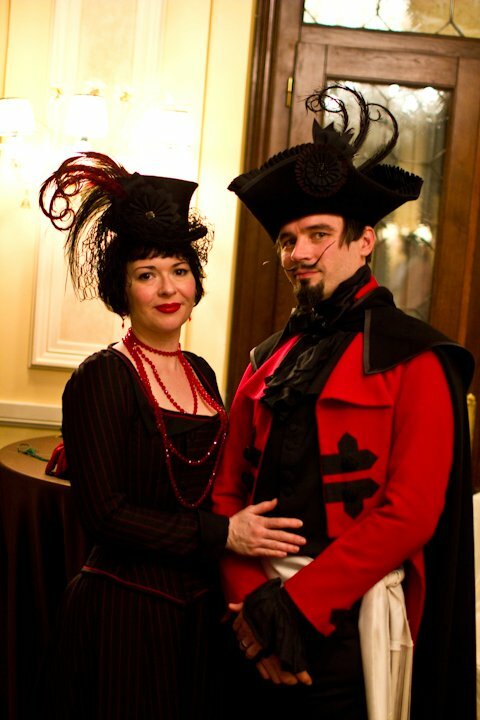 With very few exceptions, all hats pictured were made by House of Nines Design (i.e. me), and all corsets and corset-jackets were made by the geniuses at Dark Garden Corsetry. We had great luck finding fabrics and materials at Burnley and Trowbridge Co., Renaissance Fabrics, Britex Fabrics, and Lacis. Our household mascot of late has been 18th century painter Joseph Ducreux. Here John strikes a pose that says "Disregard photographers, acquire prosecco." 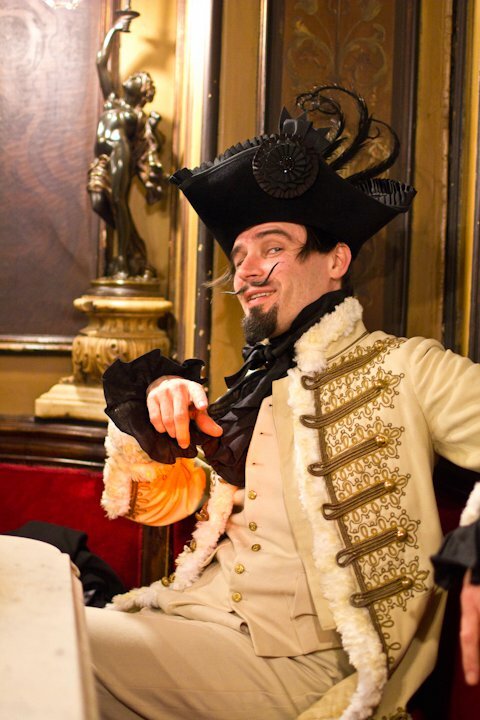 John got a lot of mileage out of his huge new Kevenhuller tricorn. Over the 10 days of Carnival, I piled more and more stuff and feathers all over my hats. I wanted them to be bigger and crazier everyday. 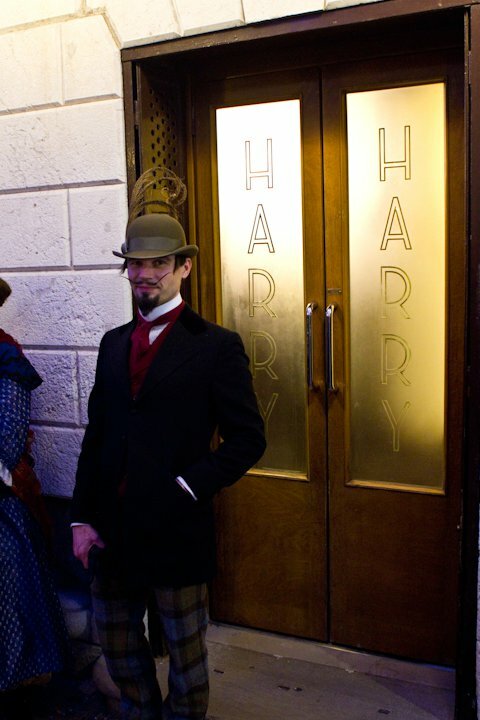 John in front of Harry's Bar. He normally wouldn't wear such enormous feathers on a bowler, but we figured: why not? It's carnival. Plus, the extra height made him easy to spot as we moved through dense crowds in the streets. We spent part of almost every afternoon at Florian, the famous cafe that's been sitting pretty on San Marco square since 1720. It has incredible ambiance and history, with mural-painted walls and gorgeous furniture, not to mention being the main hang-out of serious carnival costumers. Here's Daniel lounging amongst the art. A few days later, I re-shaped the same hat from the last photo into a bicorn, and was very pleased with the foxy results. When planning what to make for and bring on the trip, as a group we agreed on a set of themes and a basic color palette (red, black, white, yellow and gray) for most of our outfits, so our wardrobes would coordinate but not be identical. That way, we wouldn't be too matchy-matchy, but we could share accessories and use pieces in different combinations to make new outfits. 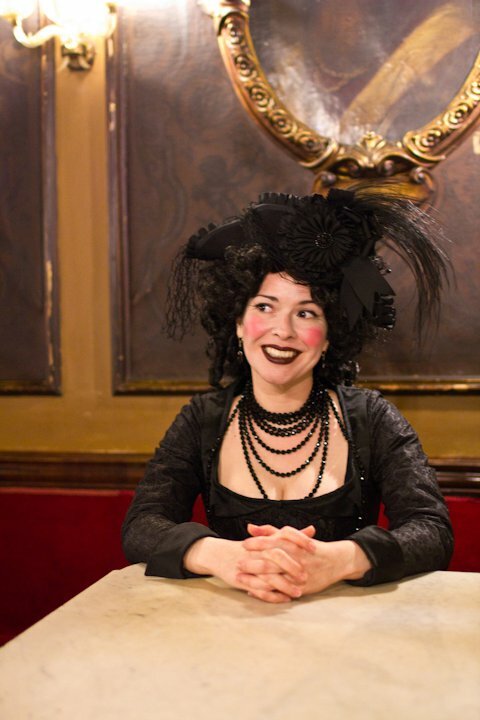 Here's Autumn, rockin' our color palette in a gorgeous 18th century gown at the Hotel Danieli on the Grand Canal. 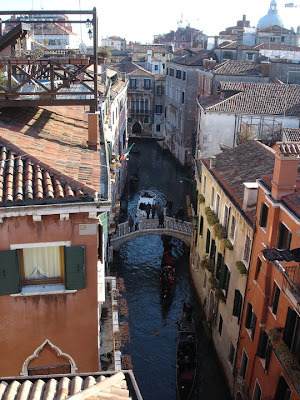 Since it was the first trip to Venice for most of us, we had to take a gondola ride. I was disappointed to find that nobody seemed to be using gondolas for actual transportation very much, it was all just tourists being taken in a big circle like a theme park ride. But it was still pretty great seeing the city from a very different angle. Autumn looked like a beautiful cupcake that day in her pink and white shepherdess dress. 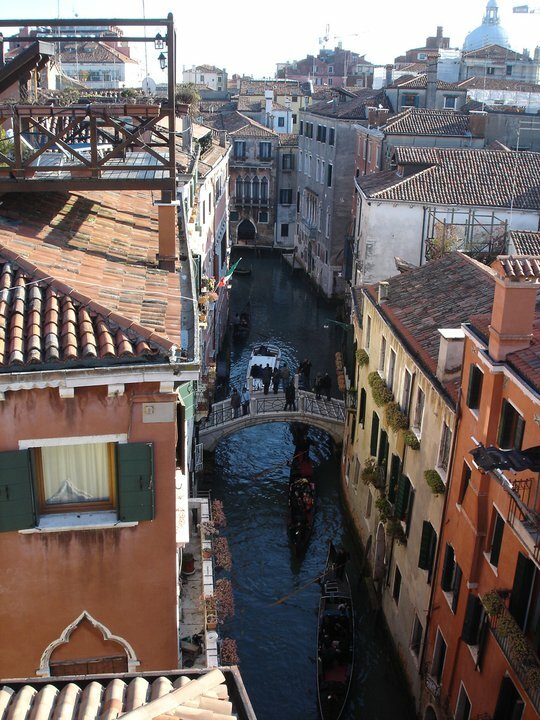 The gondolas are works of art, and pretty romantic despite all the corny tourists. I half-joked about how many lottery tickets I'd buy after we got home, to be able to afford our own private gondolier to transport us around the city next year in style. Another fun afternoon at Florian. 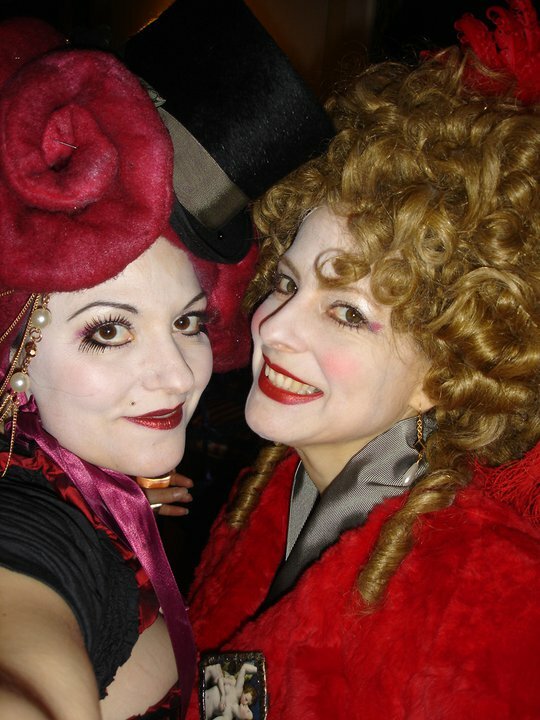 This was my first attempt at a Marchesa Casati outfit (my hero!). As she famously said, 'I want to be a living work of art.' I'll be doing more to channel her next year. Why was (almost) all food so delicious in Italy? Especially anything dairy or baked. It was uncanny. 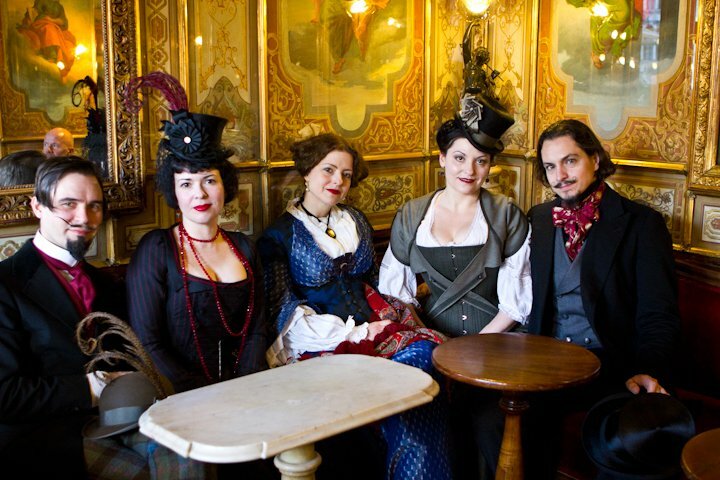 With all the Victorian-themed events we attend in San Francisco (Edwardian Ball, Dickens Fair, etc. ), a Victorianesque team costume was easy to pull together. Here are a few pieces of the circus themed team costume we brought, hopefully we'll develop it more for next year. Another fun thing to do in the afternoons at carnival is to attend one of the many lavish 'chocolates' hosted at fancy hotels around Venice. 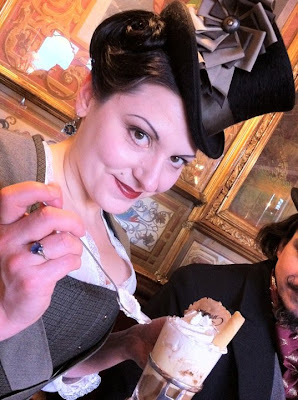 They have all-you-can-drink hot chocolate (the consistency of thick pudding, and so delicious) with special cookies and pastries. 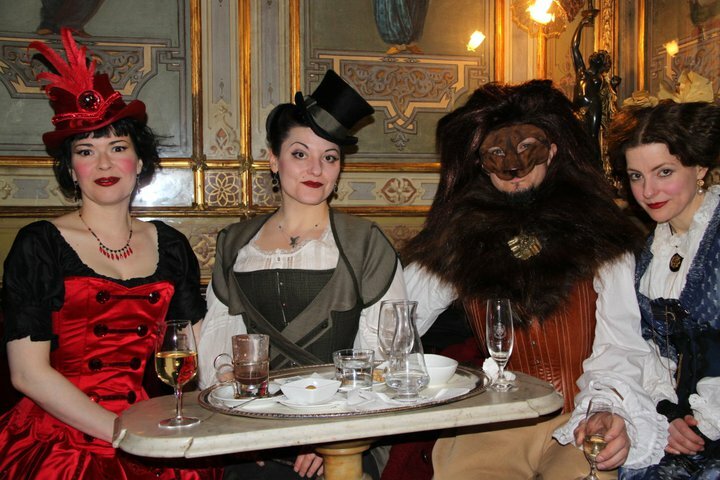 This one was especially fun, the hostess had set up 18th century card games for everyone to play. 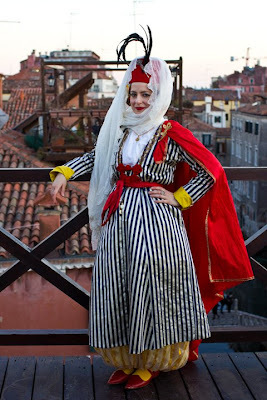 Our friend Erin met us there in full Gypsy Warrior Princess regalia. 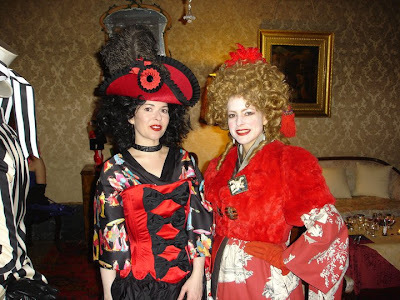 One of the highlights of the trip was a Japanese Manga / 18th century themed party. I love a mash-up, and this one was especially fun to play around with. 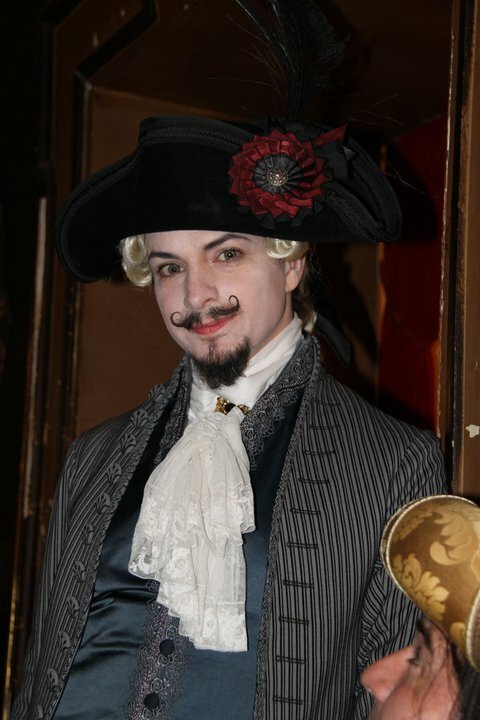 This was party number two (of three) of the evening, with complete costume changes in between. Afterward, I sat on our private roof deck and watched the sun come up. There were a lot of late nights! Another fantastic party we went to had a Turkish theme. 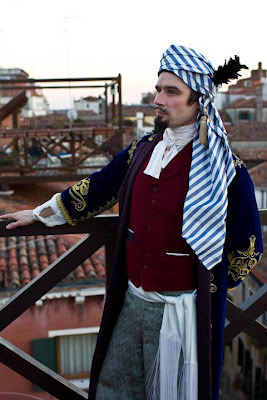 We took photos on the roof before going to the party, as the host had requested 'no photography' at the event. Here's Steph, looking picture-perfect as always. 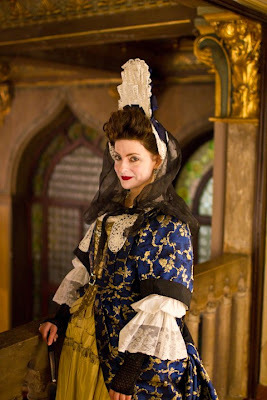 She re-purposed the yellow pantaloons from a Victorian-era 'Bloomers' outfit she made for Dickens Fair last year, and built the rest of the outfit around them in gorgeous vintage fabrics. I was surprised at how comfortable the Turkish pantaloons were to wear. On another day, I changed out the accessories, threw on a marching band jacket, and went out as a Zouve, which was super exciting because I hadn't even realized I had that costume with me till I was putting it all on. Giant pants may be my new go-to piece for next year. 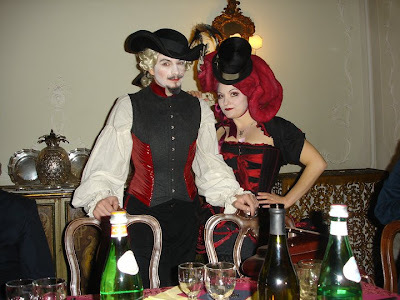 When we initially found out about the theme of this party, we wanted to make outfits similar to a Turkish/French mash-up style that was popular with avant-garde ladies in the late 18th century. It didn't work out for the rest of us, but Autumn carried it off beautifully. Maybe next year we'll have another crack at it. It's hard to believe, but the guys each wrapped their own turbans in about 10 minutes with little-to-no practice, and only a little help from YouTube. They look *fantastic*. Needless to say, we're all tired, broke, and happy. And dreaming every minute about more carnival fun in 2012. What a fantastic trip! Thank you for sharing all the visual splendor! - Jo. Glorious! I followed a friend's link from Facebook to see this. Absolutely glorious. Thanks for sharing all this! This is so inspiring! The photos and story are delightful, but I'm sure the actual experience is beyond words. If you must go broke, this is the way to do it! This looks absolutely amazing!! I would LOVE to learn more about how you planned your trip! 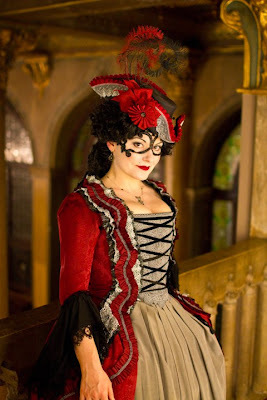 I'm hosting an 18th century Autumn Festival Masquerade event for a local charity here in Sacramento, and it'd be so FUN to be able to use my costume again. We've always talked about going to Carnival, and this is truly inspiring!